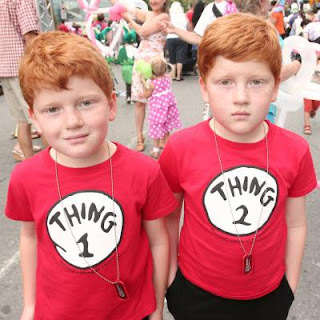 Genetics and Beyond: Identical or fraternal twins? They are so similar... but are they really the same? Today we are going to speak about the difference between identical and fraternal twins. First of all, a twin is one of two offspring in the same pregnancy. 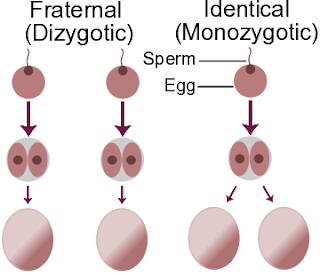 The main difference between identical and fraternal twins is that identical twins come from the same zygote that is divided in two different embryos, and fraternal twins come from two different zygotes fertilized by two different sperm cells. - If they have different genders, for sure they are fraternal twins. - The similarity in the case of identical twins is very high, at least they are genetically equal (the environment has also its effects on the phenotype, remember the post of Slight differences and Epigenetics). But the fraternal twins could be as similar as normal brothers/sisters among them. Maybe more similar because of the same development conditions during pregnancy. - Are family antecedents important? 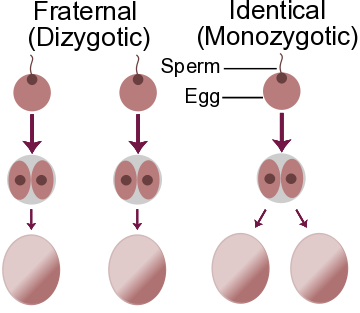 In case of identical twins the answer is no, but for fraternal twins is usually dependent of a genetic factor inheritable. - The identical twins have the same blood type. This is not always the case for the fraternal twins. This information is very useful and interesting. But, although we could think that identical twins could easily be criminals because they are almost indistinguishable, remember that our fingerprints give us away!